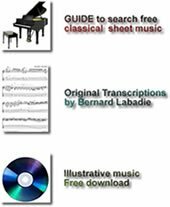 After almost nine years as Pianopassion's webmaster, I have received hundreds of emails asking for free classical scores on the net. I was able to satisfy most of them. So, as a free service, If you are looking for a free classical score and can't find it, send me an email, I'll do my best.